Recently, the Council on Asian Pacific Minnesotans has witnessed “anti-Sharia” legislation introduced in several states that are a threat to religious freedom in the United States. In Minnesota, Senate File 2281, which was aimed at targeting Sharia Law, was recently introduced, then withdrawn during the 2012 MN Legislative Session. In response to such legislation, Lori Saroya. President of the Council on American-Islamic Relations Minnesota has stated, “Across the nation, similar anti-religious freedom bills are being used by Islamophobic extremists to demonize Islam and marginalize American Muslims.” Overall, these recent developments signify the need to build more awareness around the topic of Shariah Law. Prayers on the Prairie showing on April 26th! Men praying at Al Rahman Muslim Community Center. It is estimated that 150,000 Minnesotans are Muslim, yet their religious traditions are little understood by the mainstream. Join us over lunch for a brief introduction to Islam, background on the Prayers on the Prairie: Asian-Pacific Minnesotan Religious Practices project, and conversation about what it means to be Muslim in Minnesota. 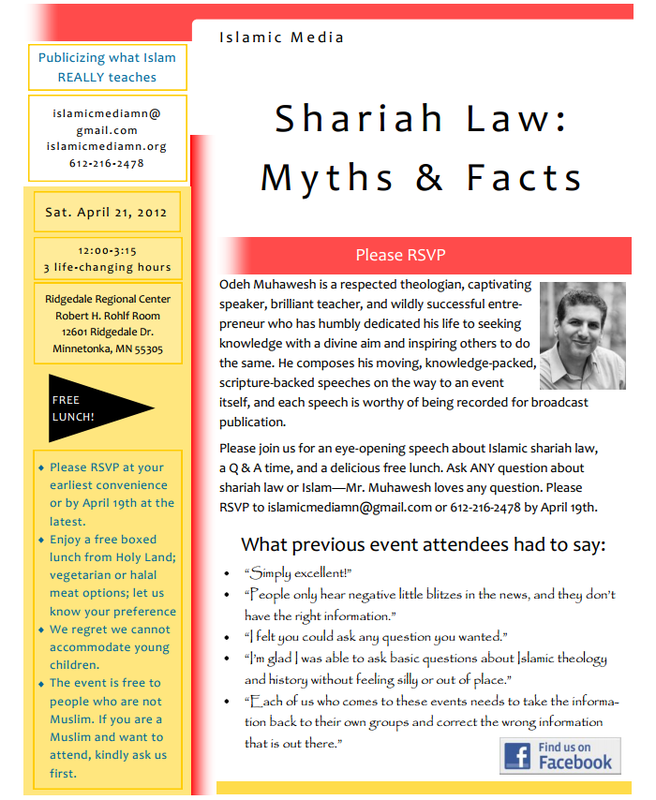 When: Thursday, April 26, 2012 from Noon.-1:15 p.m.
For information on the speaker Zafar Siddiqui and to learn more about this Lunch and Learn event, please visit our website. This event is part of the Lunch and Learn programming that amplifies collaborative work with partners. Each presentation features a leader from the community who engages participants in learning and discussion around this collaborative humanities work over the lunch hour. HF 645 and SF 947 – Collaborative grant program to reduce minority populations unemployment and appropriation. Status: Last heard in 2011, this bill did not make any movement in 2012. The bills are not expected to pass in 2012. Status: CAPM was informed that the language in the bill may have unintentional and undesirable consequences on how bullying is treated in schools. We await the governor’s bullying taskforce’s recommendation as they conduct hearing and discussions on how best to protect all students from harassment and bullying in school. HF 1907 / SF 1556 – Restores the 20% wage cut for family members providing PCA services. HF 1888 / SF 1672 – Restores cuts to Emergency Medical Assistance for non-citizens. The Senate passed the Omnibus Health and Human Services Bill (HF 2294) sponsored by Sen. David Hann (R-Eden Prairie) on Thursday afternoon. The legislation includes $22 million in new spending as a result of an announcement by Governor Dayton this week that health plans would repay $73 million to the government due to a cap on Health Maintenance Organization (HMO) profits. The bill partially restores the Emergency Medical Assistance program, temporarily restores pay for personal care attendants (PCAs) who attend to relatives, and provides dialysis and cancer treatments for non-citizens. The House companion bill was passed on March 29. The bills will eventually go to a conference committee to sort out any differences. Sen. Hann said Thursday that the bill won’t be perfect for everyone but it’s his intention to produce a bill with broad support from the Legislature that the Governor will sign into law. CAPM will keep an eye on things for the HHS bill. Status: Both bills have been active during the 2012 session and we are cautiously optimistic about the passage of the bills. Voter ID – Constitutional amendment to require Minnesotans to show a valid photo ID in order to vote. Status: The last step to put the question on the Election Day ballot came April 4, when the Minnesota Senate approved legislation passed earlier by the House. 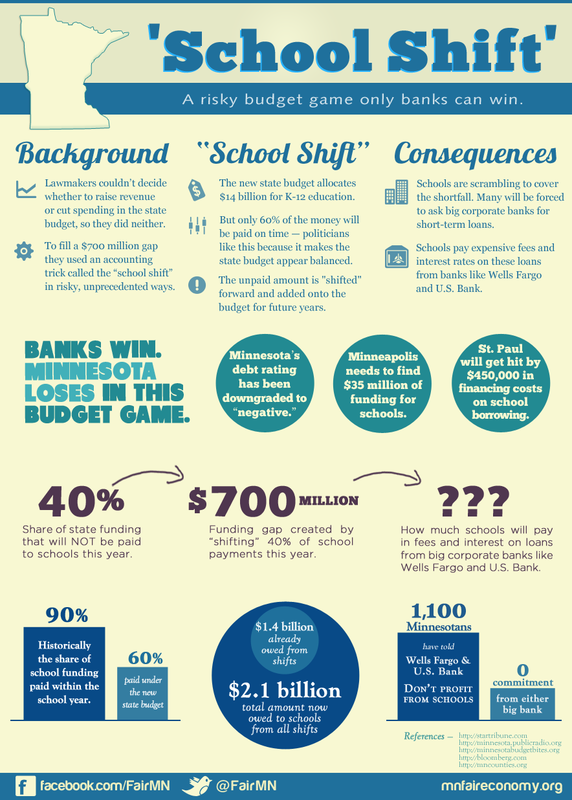 Expect a voter education campaign from organizations on both sides of the issue this summer and fall. The Voter ID amendment proposal joins the marriage amendment proposal this November on the ballot. Over 30 community organizations, groups, and institutions signed on as sponsors of the event and an estimated 150 people attended the public rally. Other speakers included Comm. Kevin Lindsey (MN Dept. of Human Rights), Asst. Comm. Rose Chu (MN Dept. of Education), Sen. John Harrington, Sen. Linda Higgins, Sen. Mary Jo McGuire, Sen. Sandy Pappas, Rep. Dean Urdahl, Supt. Valeria Silva (St. Paul Public Schools), Rick Mills (Minneapolis Public Schools CEO), David Zander, Khao Insixiengmay, Vichet Chhuon, Kazoua Kong-Thao, and Chao Lee. For a day focused on education, it was fitting that the public rally opened with a performance by the Malaysian Student Association and closed with speeches from students from the University of Minnesota and Roseville Area High School. Prior to the rally, community members were able to attend an advocacy training conducted by Organizing Apprenticeship Project. The Council on Asian Pacific Minnesotans, created in 1985, is a state agency that advises the Minnesota state legislature and governor’s office on issues pertaining to the Asian Pacific community. The Asian Pacific Day at the Capitol has been held each year since the creation of the Council. On March 12, 2011, the Council on Asian Pacific Minnesotans joined with five other sponsors to host the Burma Health Forum, which aimed to create greater dialogue pertaining to the health needs of refugees from Burma in Minnesota. The forum featured keynote speaker, Dr. Myo Nyunt, who provided political and historical background information on the country of Burma; a first-hand refugee story from Eh Tha Khu, a newly arrived Karen refugee to Minnesota; and several panelists who work in both systems navigation and health integration for refugee community members in the state of Minnesota. It is the hope of this council and its sponsors that this forum will be the first of many discussions about how to better address the various healthcare needs of refugees from Burma living in Minnesota. It is imperative that healthcare providers work with both local refugee integration organizations as well as the Burma community itself to gain a greater understanding of the unique cultural, linguistic, and personal barriers that prevent these citizens from getting the care they need and deserve. Call to Action: Without action, there is no change. 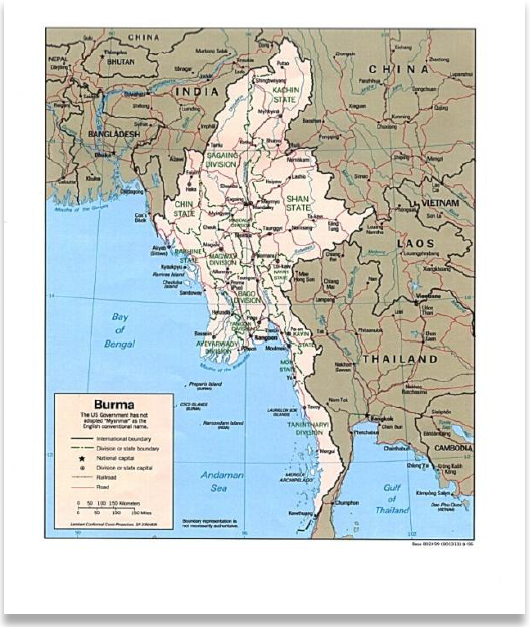 Contact your legislators: Individuals, groups, or organizations interested in speaking to legislators to advocate on behalf of the community from Burma may contact the Council on Asian Pacific Minnesotans. Connecting with stakeholders: Want to be more involved in discussing way to improve health outcomes and health care access for refugees from Burma? Please contact the Council at capm@state.mn.us as a way to get in touch with organizations and individuals working on this topic. 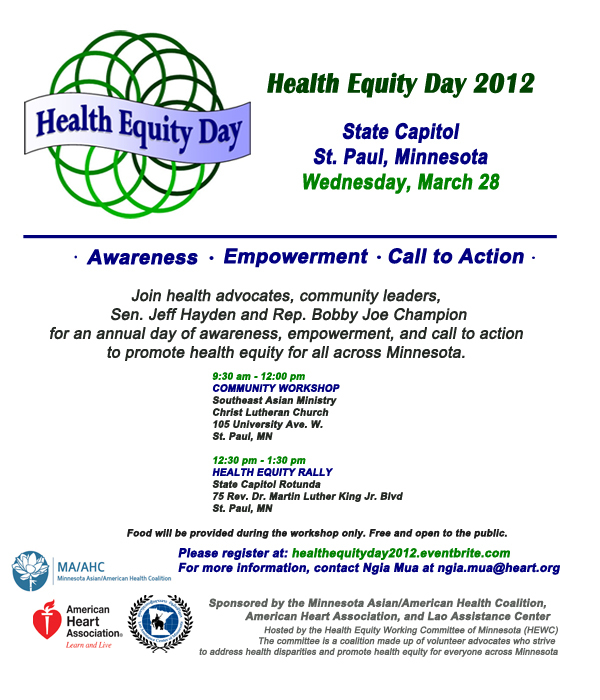 2nd Annual Health Equity Day 2012 at the State Capitol on Wednesday, March 28. 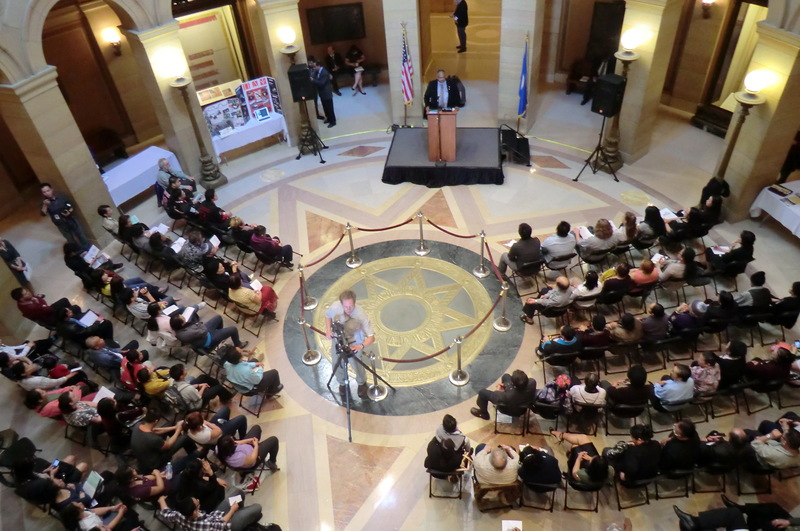 Health Equity Day is a recognition of the power of Asian, African, African American, American Indian, Latino, LGTBQ and allied communities coming together to fight for greater equity at the State and local levels in MN. The Health Equity Rally at the Rotunda will begin at 12:30pm and go until 1:30pm on Wednesday, March 28. The morning Community Workshop at 9:30am-12noon will be held across the street from the Capitol in the basement of Christ Lutheran Church. More details available at: http://healthequityday2012.eventbrite.com/ Registration is required for morning session.